Yep you guessed it, another product review. But before that, a bit more about why this healthy eating thing means a lot to me. Well for one, food is awesome. I mean really amazing, perfect, wonderful and, well, one of the loves of my life! However, eating whatever you want, whenever you want, at any quantity you want is going to get you in trouble. This I know. With everything in life, you have to give and take. Sometimes you’re the bug, sometimes you’re the windshield. Does that analogy make sense here? Anyway, I know the aspects of my eating plan that are not as good as they could be. I don’t say “should” because that would imply I wouldn’t want them to be…and that’s not the case. I want to eat healthy food. I want to feel nourished and satisfied. I don’t want to load up on anything that is going to make me feel heavy, tired, or hungry soon after I eat it. So for me, it’s all about eating fairly clean for breakfast, lunch and snacks…and if I make good decisions all day, dinner tends to be a little more lenient. What’s a good decision you ask? Enter Pure Bars, the certified organic nutrition bars which just so happen to be gluten-free, raw and kosher. Seems like a mouthful, right? Well, don’t be intimidated. While these buzzwords may make you think “bland,” you’re completely wrong. Pure Bars, which come in six very different flavors, are anything but. The best part about these bars is that the flavors are completely different from one another. My favorites were the wild blueberry and cranberry orange, which surprised me. I'm definitely a chocolate person but this time, fruit prevailed!! The blueberry tasted a lot like a blueberry muffin. Anything that boasts high nutrition but can taste like a baked good is A-OK in my book. Especially a little bit heated (or toasted) yum. Slightly sweet with a big fruity blueberry blast. NOT TO BE CONFUSED WITH BLUEBERRY "FLAVOR" which to me, is not the same. I despise imitation blueberry. This was not imitation--HALLELUJAH! Apple Cinnamon was another one of my favorites. Apples and cinnamon go together like peanut butter and chocolate... they were meant for each other. I loved the spicy cinnamon and sweet chewy apple. Oh by the way, most Pure Bars are fairly chewy, not crunchy at all.. except a few pieces of nuts here and there. Chocolate Brownie is a solid nutrition bar. Now, I'm not going to tell you it tasted exaclty like a real brownie fresh out of the oven, and maybe that's because I might have had a fresh brownie out of the oven recently and well, everything has its place. I will tell you, though, that I've had tons and tons of chocolate flavored nutrition bars, and while most taste like cardboard, this definitely has its hints of cocoa. I had the opportunity to have two samples of every flavor, and this one definitely grew on me more the second time I had it. Cherry Cashew got me through an excruciating study session of advanced exercise physiology. 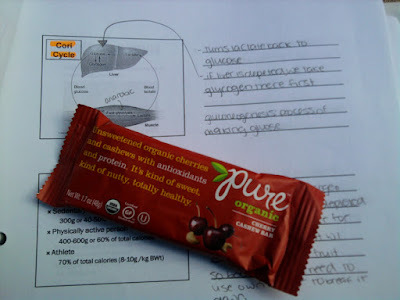 What better way to study the Cori Cycle than by filling my body with protein and antioxidant rich Pure Bars right? The cherries are sweet and tart and this bar in particular had a familiar taste. Almost like a candy or even a fruit roll up? Works for me. Trail Mix was a little bit different than the rest of the bars because it did have a bit of a crunch. Its a definite go-to snack and it's got a mixture of chocolate, raisins, walnuts and sweet apples. Last but certainly not least, Cranberry Orange was a fresh complex flavor. I loved the bright citrusy burst and the sweet tartness of the cranberry. It kind of reminded me of the holidays a little bit? I don't know why. Can't explain the way my brain works...but it was the perfect balance of sweet and tart. This is what most of them look like! As I mentioned before, Pure Bars all have a unique taste. Definitely good for different moods or different cravings. Something more homey and comforting would be a warmed up Blueberry or Apple Cinnamon. Something to perk up your morning might be a Cranberry Orange. The Chocolate Brownie would be a fabulous snack with coffee or after dinner treat-- pick your poison! Regardless, I would recommend Pure Bars. For about 200 calories per bar, jammed with protein, fiber, healthy fat and duh--flavor, it's a great pick. Oh, and if you're a parent, I think you could easily market these to a child. The wrappers are pretty and colorful and you might be able to pass it off as a candy bar. Who knows? Whatever the case, try one--you'll be glad you did! You can buy Pure Bars at Trader Joes and most Whole Foods. Find one near you! I love the crazy flavors! These look delicious :) I'll have to keep my eyes out for them...they'd make an awesome after school snack! Thanks! I've seen these, but never tried them. So glad you reviewed! The blueberry cranberry/orange sounds very ingriguing! Thanks for introducing me to another healthy snack. I'm always looking for more bars to take to my long graduate seminars. Thank you for sharing...I hope your Friday is delightful!